Fluorescence-based techniques are priceless tools for studying cellular structure and functions and understanding interactions of molecules in various biological systems. Fluorescence is also important in the detection and quantitation of nucleic acids and proteins in gel electrophoresis, microarrays, and fluorescence spectroscopy. A large variety of fluorescent chemicals have been synthesized and modified to specifically interact with cellular structures in order to make them detectable in many different colors and with the help of sophisticated microscopes and instruments, it is possible to detect, image, and measure the amount of fluorescence in samples as small as individual cells, and with multiple fluorescent colors. 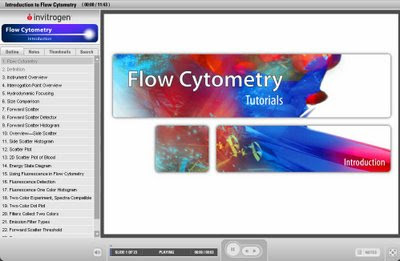 For those who are already familiar with and for those, who would like to get familiarized with the exciting basics of fluorescence and flow cytometers, click here for set of informative online tutorials.